Red and Green stretch terry. Easy to put on, take off. Washable-will not shrink or stretch out of shape. 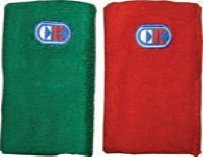 Set includes: 1 Red Band and 1 Green Band.